Bet Glorious Empire to Win, Place and Show with Betfair. It has been well-documented. No Arc winner has won the Breeders’ Cup Turf in the same season. But is Enable different and if so why? The quickest argument to suggest that she is and the result this year will be, is that she has had only two races this year. This is a strong case to build for horse racing betting fans, because in looking at her win in the Arc, it may have not been the strongest win versus the strongest group. The fact that Sea of Class was able to make up the lengths she did given her draw and early position doesn’t speak well to those she ran past. Thankfully Enable encountered a less than stellar group, because I do not think that she was at her absolute best, something John Gosden suggested immediately after her win. She will take a step forward I am convinced. But I was also convinced that Arc winner, Dylan Thomas, could not lose the Breeders’ Cup Turf in 2007 over the “bog” of a turf course at Monmouth Park. He finished fifth of eight. Breeders Cup betting fans should include her but do not end their search with her. He has become a different horse since being stretched out to longer distances. Two races ago he was handed the lead and was able to slow things and upset a Grade 2 at 22-1. Last race he found the lead but was forced to go faster, granted the turf was much faster that day. Whether you agree or not, the reality is that Glorious Empire at 12/1 with Betfair, has confidence in himself. In racing, you will see horses string together races that seem out of character, but largely, especially at this level, you can see why. He’s a horse that’s has the pedigree to go this far who couldn’t make the lead in shorter races. He’s finally been put in a position to succeed and he has not disappointed. Bet Glorious Empire to Win, Place and Show at 12/1 and most likely higher with Betfair. Waldgeist, at 7/2 with Betfair, clearly would not be a surprise for Andre Fabre, who has had great success with Arc also rans in the Breeders’ Cup Turf. But as in the Arc his post position does him no favors in this three-turn, 1 ½-mile run at Churchill. I will be more inclined to lean on Enable’s post and early speed than hoping Waldgeist can overcome post 12. Hi Happy (20/1) is better than the price suggests, but the potential for softer ground degrades his chances. Magical (10/1) will contend with being second choice in this race, so 10/1 seems impossible. I think it’s justified, as we have seen when Aidan O’Brien gets a good filly he can race them often at a high level. B.C. Turf winner Found instantly comes to mind. Finally, watch out for Robert Bruce (10/1), as I think his price will drift the mindset that Magical takes more money. His run over soft turf in his last race was very strong. 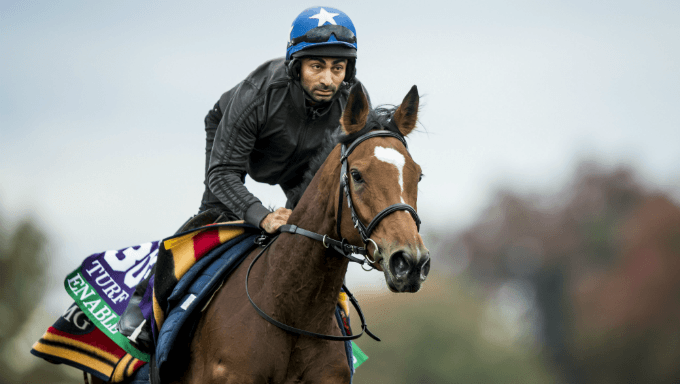 Enable will be the biggest favorite of the Breeders’ Cup’s two days. She’s racing against history and on a quick turnaround. Clearly you won’t let her beat you in multirace exotic wagers, but betting her to win is a waste. Either sit the race out or have a win or across the board wager on horses such Glorious Empire, Magical or Robert Bruce with Betfair.